Community Colleges are invaluable resources in meeting the educational and economic needs of their communities. Each college reflects the standards of excellence the community sets for itself. Responsibility for continued excellence is shared by all who appoint or elect trustees to govern on their behalf. Effective boards form a cohesive group able to articulate and represent the public interest, establish a climate for learning and monitor the effectiveness of the institution. The Knowledge Center provides additional resources on governance, trustee education, advocacy, student success, and more, exclusively for ACCT member colleges. You will need to log in with your username and password to gain access. 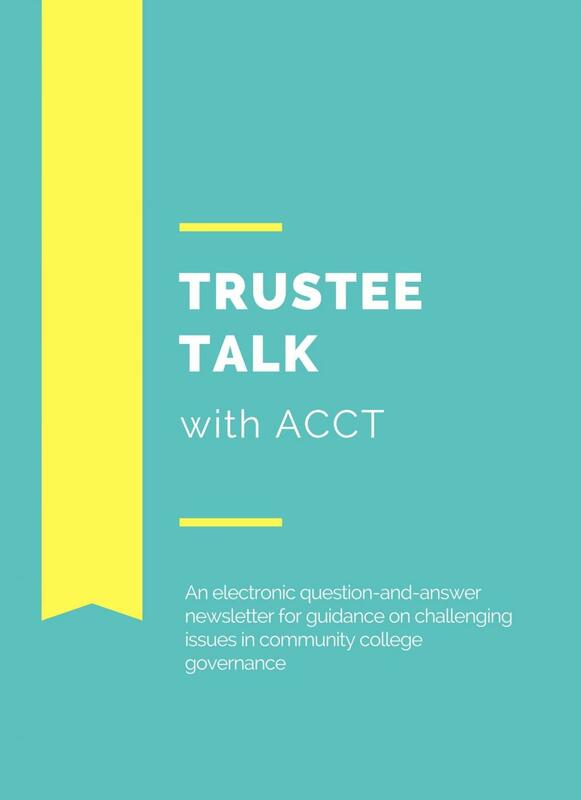 Trustee Talk is an electronic question-and-answer newsletter for guidance on challenging issues in community college governance.